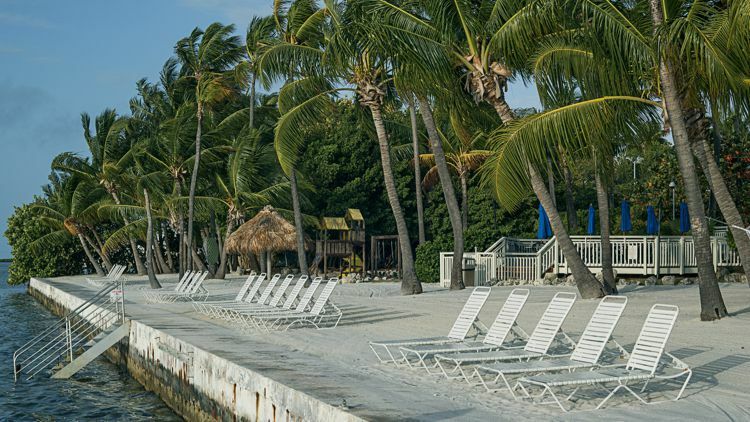 Will Amara Cay Resort on Islamorada Be Your Kind of Florida Keys Getaway? Amara Cay is a welcoming, 110-room resort on Islamorada in the Florida Keys. Islamorada is a key (or "cay") -- an island -- in the Florida Keys. This resort presents an easy getaway. Let me explain. Amara Cay is indeed set on the Atlantic Ocean. But like many Keys resorts, Amara Cay has a beach that does not lead into the water. The resort is the size of a boutique hotel, with 110 guestrooms and suites. Rooms are very appealing: good-looking and intelligently laid out. A Room or Suite at Amara Cay? Guest accommodations come in three styles. King guestrooms are quite compact, with a premium pillow-top king bed. The couch turns into a sleeper sofa. Deluxe suites are much roomier. Accessible rooms are designed for enhanced mobility and safety. A compact but complete indoor fitness room is open as of mid-December 2015. • Entry is 24-hour with your keycard. There is no club floor or club lounge at Amara Cay. • Oceanfront rooms are at other end of a long corridor from the elevator. I found that taking the stairs (at least descending) saved a lot of time. The resort has one restaurant and two bars. Fortunately, the restaurant is terrific, and you'll want to have more than one meal here. Amara Cay's signature eatery, Oltremare, is a modern Italian restaurant. It's open for breakfast, dinner, and weekend brunch. Its bar is open all day. I enjoyed my Italian dinner at Oltremare. But what won my heart here was the unforgettable brunch. • I love Cobb salad, and this Key Cobb was magnificent: soft Florida Gem lettuce, a lush half Hess avocado, heirloom tomato, tons of thick-cut bacon, and, over it all, buttermilk dressing, creamy Gorgonzola, and a poached egg. The restaurant's indoor bar has it all: interesting global wines, spirits, craft beer, and creative house cocktails. Amara Cay's outdoor bar, open from lunch through late-night, is named for Johnny Depp's raffish privateer in Pirates of the Caribbean. Room service from Oltremare's kitchen is available between 6:30 a.m. and 11 p.m. The pool is large and surrounded by lounge chairs. As is common in the travel industry, the Luxury Travel Expert was hosted by the hotel in order to describe it. For details, see our site's Ethics Policy.